The late September visit to Gloucester Massachusetts found the Andy, Rich and their host, Capt. 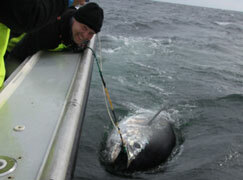 John Pirie of On-Line Fishing Charters , involved in a run and gun shootout with Bluefin Tuna. 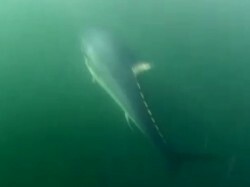 Bluefin Tuna from 50lbs and up were busting the surface in pursuit of mackerel and baby bunker. The fishing was highlighted by breathtaking high speed runs to the feeding fish. If you have questions about any of the equipment used during the show, please contact us. Imagine flat calm seas, bright sunny days and you are fishing within one mile of the Gloucester, Massachusetts coastline. “Fish, Fish, Fish, Two O’clock, Go, Go, Go” a spotter screams. The twin Yamaha outboard throttles are pegged and the boat hurtles towards the fish at over 50 knots. As you approach the fish, still busting madly, the throttles are put into neutral, the boat settles into the water and the anglers cast into the melee of 50-75lb bluefin tuna crashing mackerel on the surface. The first lure to land is a Stillwater Smackit Popper painted blue and white like the spike mackerel the tuna are feeding on. One pop, nothing, two pops and a large boil betrays a near miss by a tuna. Third pop and another swing and a miss by the tuna. Facing strike three the tuna goes airborne behind the popper and in a flash of spray the lure disappears. “Tuna on a plug! 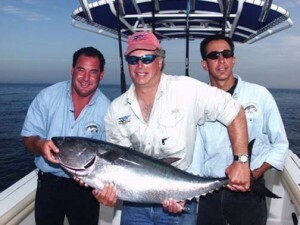 Tuna on a plug!” Rich Tenreiro has just hooked himself into 65 lbs of sheer speed. The tuna accelerates and the reel is dumping fast. The key now is to survive the first two runs without getting spooled. The boat is back on plane and we are staying with the fish. Half a spool left and Rich is doing well. The tuna slows and the boat comes off plane. One more run and the fish begins to circle underneath the Edgewater 24¹. As he approaches the surface I use the large landing net and grab the tuna as he circles past the gunwale. High fives all around, a couple of pictures and …”Fish, Fish, Fish, Seven O¹clock, Go, Go, Go”… we are back at it again. For the past few years, anglers in the near-shore waters of Massachusetts Bay from Chatham to Southern Maine have been experiencing incredible opportunities to catch school bluefin tuna on light tackle. The key is fast center consoles, spinning or casting tackle and the right lures. Large diesel Sportfishing rigs normally used to troll tuna simply are not fast enough or agile enough for this game. The surface shows often last less than a minute and sometimes only allow anglers a single shot at that school. Making this shot is hard. You are holding on for your life as you skip along the wave tops at 30-50 knots. The boat drops off plane instantly and you have to gain balance, calm your heartbeat, read the fish and make a perfect cast. If you can do all of that and you have the right lures, most of the time you will hook up. Then you just have to land the fish. Sounds easy right? While hooking and landing one of these fish is a serious challenge and a significant achievement, our anglers often get ten to twelve solid shots a day. Our data indicates that we hook a fish about one out every four good shots if the angler completes a good cast. The captain and the angler need to be working perfectly together. If the captain comes off plane correctly, you should coast up alongside a busting school so they are on your beam. Never cast in front of the boat since the boat¹s forward momentum makes a proper retrieve impossible. The ideal angle is fish feeding parallel to the boat, your cast crosses their forward path and you get a 90 degree angle between your cast and the fish’s path. This allows for solid, corner of the mouth hook ups. How should I set the hook ask most anglers? Just hang on is the answer. Feeding speed is based on bait size. When feeding on spike mackerels tuna are feeding at about 20-30 knots. When they eat your lure the hook is already set. Lures are large jigs such as the swimming jig. 3-4 oz is about right since you are either throwing 30 or 40 pound mono. For poppers we prefer to use braided lines which are far lighter and allow for greater capacity on small reels. Excellent drags are a must. One angler likened this sport to standing at a highway off ramp and casting at passing sports cars. Rods need to be quite heavy with a decent amount of tip action to help cast the heavy jigs and light poppers. 7 foot rods are as long as you want to go. Fighting belts are highly recommended. 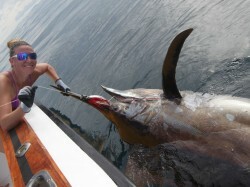 Average fight time with a 50lb tuna is about 15-20 minutes on such tackle. Hook an 80lb fish and you will be there for at least 45 minutes and the 100-120lb fish will easily take an hour. These fish are also going to spool you if you don¹t chase them for the first two runs. Try to keep half a spool on the reel, when you get below this your retrieve time is very slow because the spool diameter has become so small. However, if you constantly chase the fish you will not tire it out. We use a lot of drag, 30-40% of line strength. Let the fish tow the boat around for a little while and they will tire rapidly. For most people, tuna fishing conjures images of trolling multiple lures in the wake of a large boat. Trolling rods are rated for 30-80lbs and fish are winched in rapidly when they are in this size range. We have worked hard to develop specialized techniques that will allow anglers to be successful chasing these “schoolies” in small center consoles with relatively light tackle. 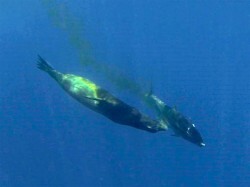 When tuna are busting on the surface on small bait they will not take trolled lures very readily. People trolling quickly become frustrated. The one thing we are absolutely certain of is that these fish are keyed in on size. When feeding on peanut bunker we are using small jigs in the 2-3 inch size. The lures must match bait size or the tuna won¹t touch them. These fish have garnered a lot of attention in the past couple of years. They have become quite dependable in their annual showing off of Gloucester. There are several qualified charter operations specializing in this fishery. The fish first appear in June but only sporadically. As the large bait schools move inshore in August the fish leave the offshore banks and come in tight to feed. Anglers have hooked and landed a number of fish from shore, although it is important to note that one can still not do so illegally. In fact, the NMFS is actually considering issuing tuna permits to shore anglers. Most of the time these fish can be found within a mile or so of the beach. Many times they are only a few hundred yards offshore. This makes these fish an excellent choice for small boat anglers. If you are looking for something new and you have a taste for excitement give the school bluefin tuna a try. However, the warning on the package should read: Anglers Beware: Extremely addictive, contents known to destroy sleep, guarantee late dockside arrivals, and likely to damage long term relationships. Proceed carefully. These fish will get under your skin. We will often come back from our second charter of the day and sneak out for the last hour of light just to get another shot at these fish.